Famously beautiful long-distance track circuiting the often remote Iveragh Peninsula. Follow old lanes and tracks through varied scenery: beaches, to clifftops, to sheep-studded fields, to mountains and moorland. Note: Negs: Likely bad weather. This famously beautiful long-distance track circuiting the often remote Iveragh Peninsula is the country’s longest formalised trail, and one of its finest. Follow old lanes and tracks through varied scenery: mountains, moorland and boggy slopes, to sheep-studded fields, to beaches and clifftops. Stay in traditional villages, enjoy the local ways and friendliness. Because there are no traditional footpaths/rights of way, much of the route is on old country lanes. Elsewhere, this might detract the delight, but not here; many of them are approaching art forms in their own right, so pretty and interesting and empty are they. The trail starts and ends in Killarney. It generally sticks to the valleys, mid-slopes and some stretches down by the sea, and takes 10 days or so. There aren’t formal ‘stages’ as such, and one is slightly left to one’s own devices to work out what is realistic on an energy-v-realistic-accommodation matrix. Day 1: Killarney to Black Valley – 21.5 km. 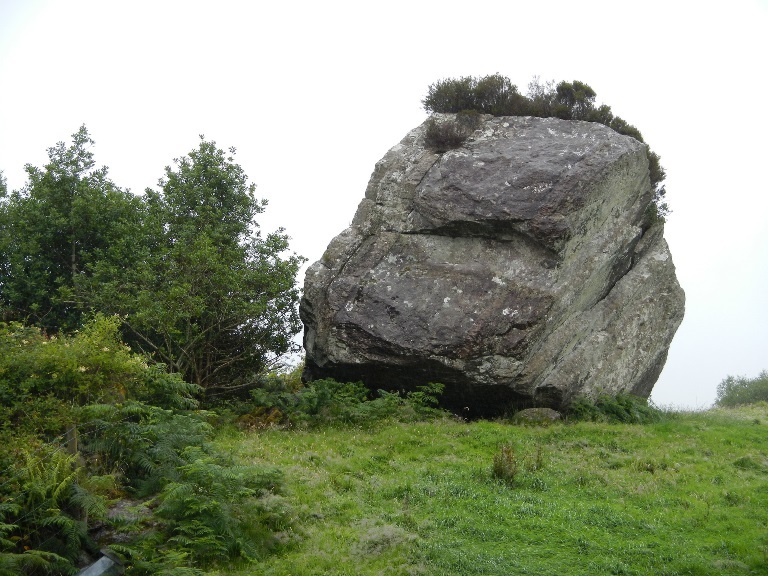 Once you have escaped the suburbs of Killarney, the walk beside the Killarney Lakes is attractive, if popular. One of Ireland’s loveliest track walks is the stretch which follows the Old Kenmare Road from just above the Torc waterfall across the hills south of the Killarney Lakes to Galway’s Bridge by the modern Kenmare road. 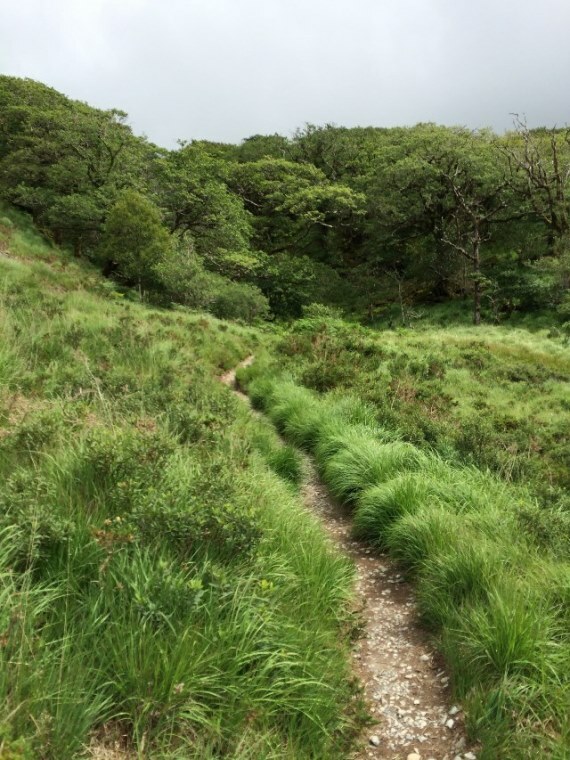 It is, we guess, 8km of fine old graded track, which climbs through mossy, ancient woods up to the high moorlands and hillsides, where it meanders its way behind Torc and Cromaglan mountains before dropping to the church. 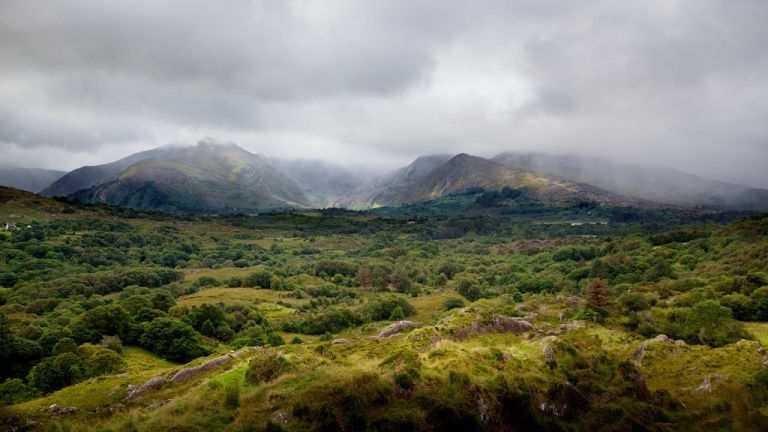 Enjoy fine views of hills and boggy moorland, and glimpses of the Killarney Lakes and MacGillycuddy’s Reeks. 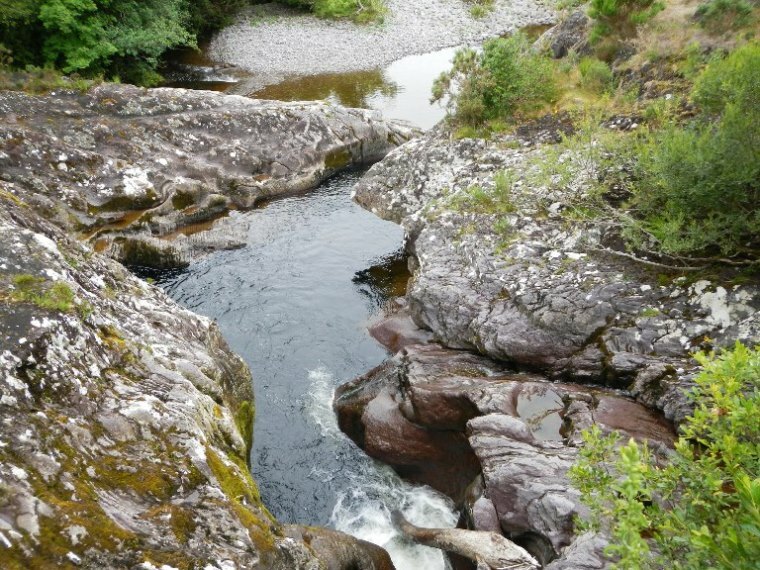 You will particularly enjoy narrow, wooded little Esknamucky Glen. 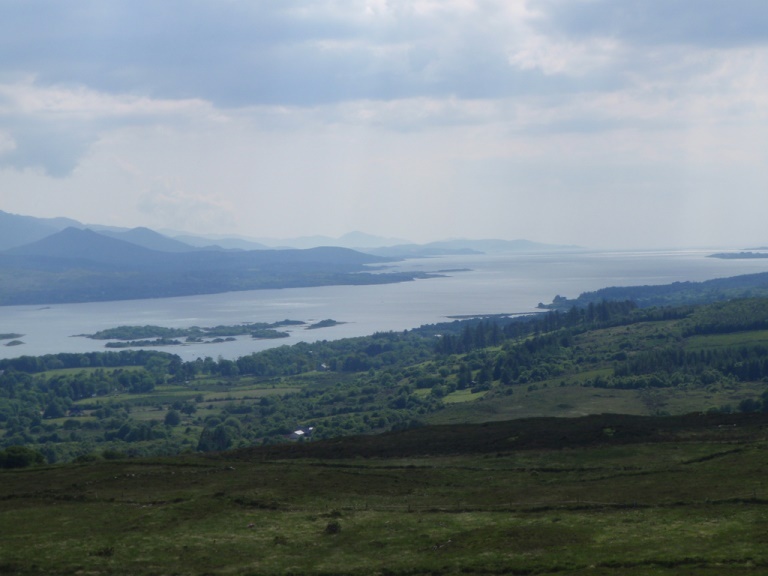 Climb Torc Mountain for stupendous all-round views, if you are feeling energetic. The Way then drops from the Killarney-Kenmare road to the shores of the ridiculously beautiful Upper Lake, which it runs beside round to Lord Brandon’s Cottage to the west, and on to the base of the Black Valley. Day 2: Black Valley to Glencar - 20.5km. Takes you on up by the Gearhameen river to the stunning lakes in the upper valley, and on west beneath the highest peaks of Macgillycuddy’s Reeks. It crosses the rocky saddle with the Bridia Valley – stunning views both ways – and drops steeply to the wide lovely valley floor. You then swing north onto the Lack Road path, crossing another saddle then dropping to Lough Acoose, then on along roads to the lonely hamlet of Glencar. 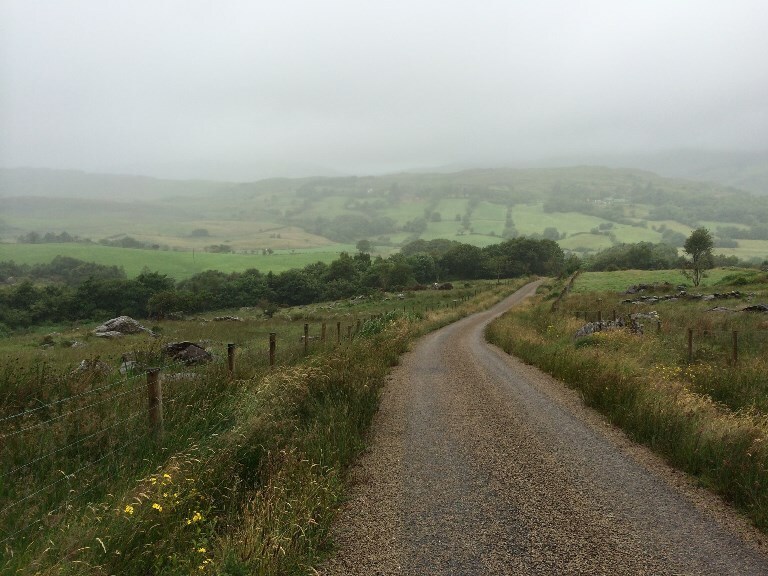 Day 3: Glencar to Mountain Stage above the North Coast – 18.5km. A straightforward but pleasant 18km across a valley and traversing hillsides, swinging west above the north coast, through Glenbeigh after 12km, a pleasant place to stop for the night if you feel like an easy day after the rigours of the first two. 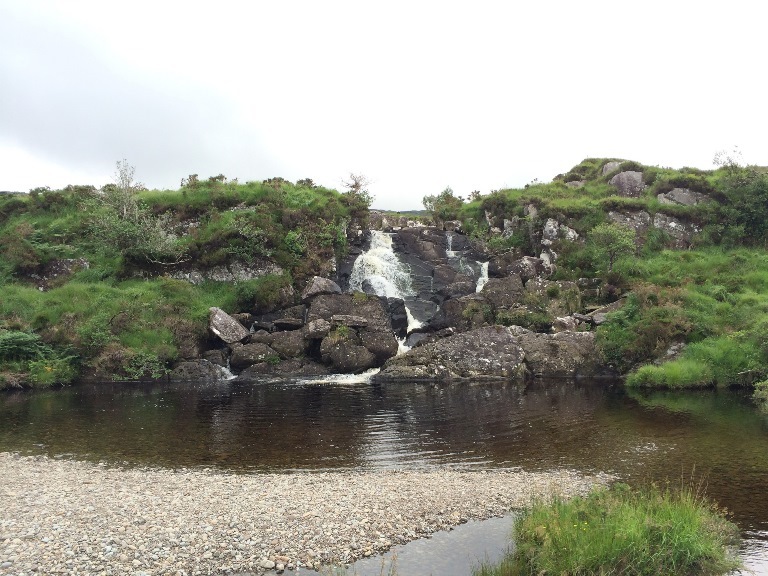 Day 4: Mountain Stage to Cahersiveen – 20.5km. A fine days walking on the hills and in the valleys above and behind the north coast, if not the outstanding day of the Way. Day 5: Cahersiveen to Waterville – 17km. A gorgeous walk across the hills and valleys of the interior to Waterville in its deep bay on the south-west coast. A highlight, and could be brilliant day-walking too. Day 6: Waterville to Caherdaniel – 27.5km or 12.5km. There are two choices here: a long and lovely circuit inland via a ridge then the slopes about Lough Currane, then crossing Eagle Hill to reach Caherdaniel above the south coast: or an also-lovely wander near and behind the coast, via stunning Derryname Beach and the historic Derryname House. 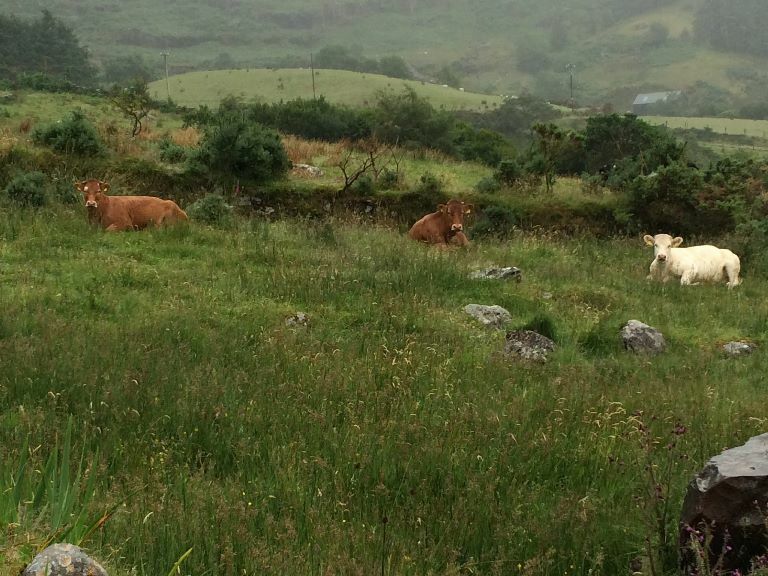 Day 7: Caherdaniel to Sneem – 16km. An enjoyable day on the slopes above the south coast. 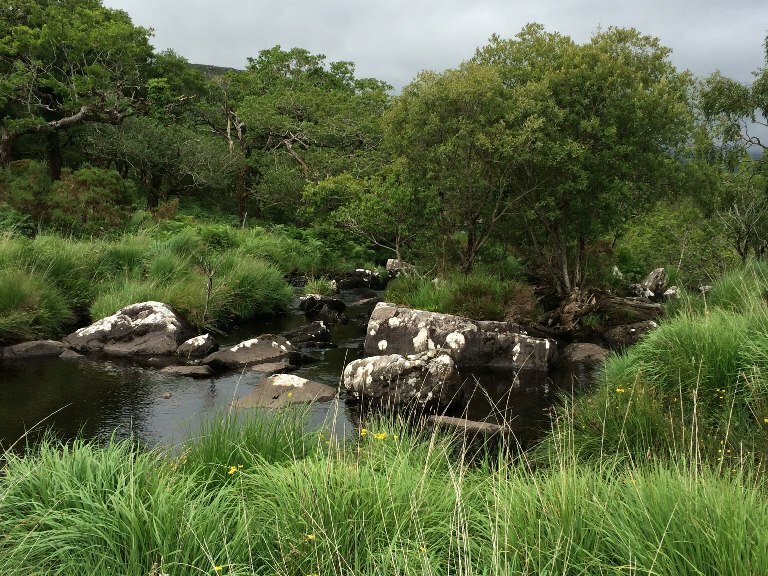 Day 8 – Sneem to Kenmare – 28km. OK, this is a long day, but very doable if you give yourself time, as it potters parallel to Kenmare bay for most of the time. It is arguably a bit dull, much of it near (or even on) the main road. Some may break this into two days. Not the most thrilling section of the Way. 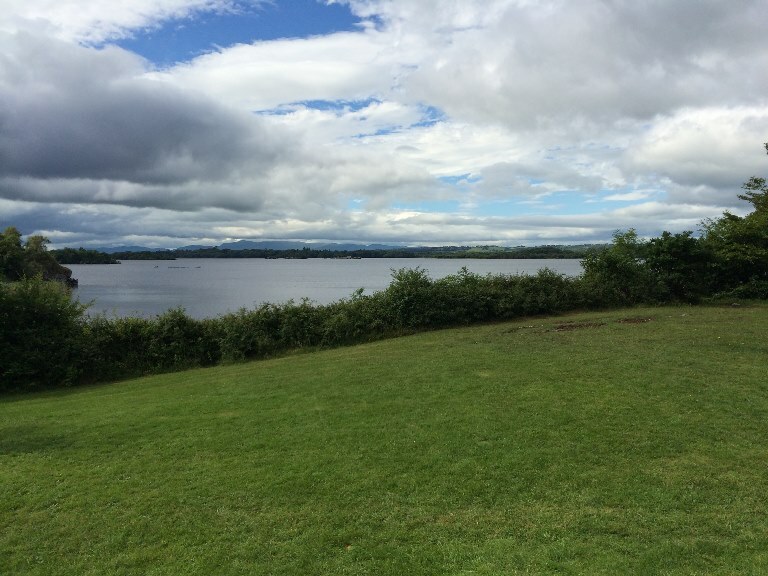 Day 9: Kenmare to Killarney – 24.5km. A long but magnificent final day, crossing the hills north of Kenmare to complete the circuit just above Galway’s Bridge, high above the Upper Killarney Lake after some 10km. From here you retrace your steps from Day 1, along the old road across the lovely hills south of Killarney Lake, behind Torc Mountain and back down through the woods to the lakeside and thence back to Killarney town. It would be quite reasonable to stop at the road east of Torc Mountain, if you can work out the transport. Day 1, which can be tackled in shorter stretches, ie Old Kenmare Road and the Upper Lake. Accommodation: There is a variety of accommodation along the way, although not at the end of all stages, so you will need to construct your days to fit your accommodation needs. Varies from hotels to pubs to BnB to hostels. The Kerry Way website has good information. Visit Hillwalk Tours’ website [insert link for Kerry way walk on their website – borrow from existing on site] for expeditions and more information on the route. www.kerryway.com is a good information site, although it is not helpful on recommending potential day-stages, or accommodation to fit those stages (We suspect this is a result of local politics). Instead, you have to piece together which of the 23 stages it identifies ends with realistic accommodation. THANK YOU ORANGINAS! See their full thoughts on their site. The South-west gets a lot of rain and wind, plus cloud/fog [and winter snow on high ground. There is little shelter on the mountains, either from sun or rain. Be prepared, both mentally and with the right kit. Best books: The Dingle, Iveragh and Beara Peninsulas: A Walking Guide – Adrian Hendorff, Collins Press walking guides; The Mountains of Ireland – Paddy Dillon/ Cicerone: enthusiastic and exhaustive exploration of every one of the country’s 2,000ft summits. Find relevant books on Amazon.